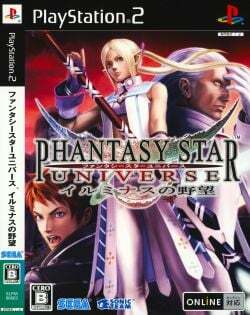 Game description: Phantasy Star Universe: Ambition of the Illuminus is the enhanced edition of Phantasy Star Universe, bringing a more personalized and interactive universe to the series. The online multiplayer world has been expanded, enriching the battle experience for up to six players with additional new maps and levels and lobbies. Gamers now have more customization options for their characters with additional weapons, armor and clothing, and they can bring this greater level of customization into their rooms, with the new room grid system that allows full customization of their personal space. Ambition of the Illuminus is a direct continuation of Phantasy Star Universe. Shortly after the defeat of Magashi and the Endrum Collective, a mysterious group known as the Illuminus have appeared and threaten to exterminate all non-human races. The GUARDIANS are under attack, and Ethan Waber is now wanted for an attempted assassination. GUARDIAN instructor Laia Martinez is determined to find Ethan at any cost. As a new GUARDIAN receiving guidance from Laia, the player must search for Ethan and uncover the truth. This page was last edited on 16 April 2019, at 09:22.